Rick and Morty gets multiverse theory wrong. That’s OK. The show gets multiverse theory totally wrong—but it’s still wonderful. First, we’re introduced to Dimension 35c, a universe with the perfect climate conditions to grow mega trees. Then there’s the future dimension with serum to fix broken legs at every corner drugstore. And the universes where pizzas eat people, everyone looks like Eric Stolz from the movie Mask, and of course, the one with the best ice cream in the multiverse. The multiverse in all its incarnations—parallel universes, alternate realities, other dimensions—has long been an irresistible theme in science fiction. Most depictions of the multiverse involve one, maybe two universes besides our own. But when it comes to Adult Swim’s Rick and Morty, it’s hard, maybe impossible, to keep an accurate count. The animated series, whose long-awaited third season premieres Sunday, follows deranged genius Rick as he tears through dimensions like a bull in a cosmic china shop, leaving behind a trail of Cronenbergs and corpses. He often brings his dopey grandson, Morty, along for the ride. In a YouTube description, Adult Swim calls Rick and Morty its “most scientifically accurate animated comedy.” The show does pack in a good amount of physics references and puts its own hilarious, bizarre twist on them—which as a lapsed physicist–turned–science writer, I certainly appreciate. Personally, I rather like the idea that Albert Einstein discovered special relativity after getting beaten up by testicle-headed fourth-dimensional beings. Rick and Morty’s unique spin on the multiverse isn’t meant to reflect real physics. Yet physicists who study the cosmos appreciate the fact that it is bringing an esoteric scientific debate, whether there is such a thing as the multiverse, into the public spotlight. Among physicists, there’s no consensus on whether the multiverse actually exists—or even what the word means. Some believe it could exist and try to find traces of our universe colliding with a neighbor. Others call the theory utter nonsense since it says everything is equally probable, and so nothing can disprove the idea. The concept of a multiverse originally came from quantum mechanics, the branch of physics that explains the very strange world of the very small. In quantum mechanics, the many-worlds interpretation states that every event causes the universe to split off into different versions that encompass all possibilities. So, a simple coin flip would generate two parallel universes: one in which the coin landed heads, and in the other, tails. 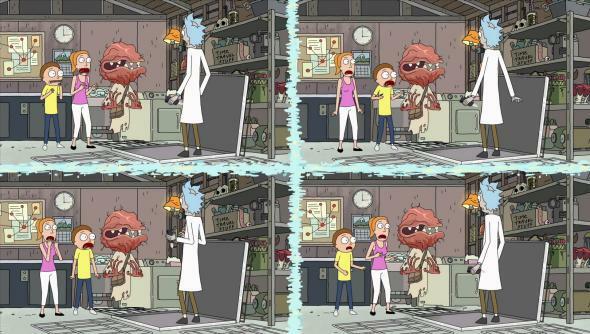 The episode “A Rickle in Time” riffs on this idea with uncertainty after uncertainty resulting in 64 parallel timelines and floating Schrödinger’s cats. Today’s concept of the multiverse arose as an accident of sorts. The theory of cosmological inflation imagines space-time as a loaf of rising bread, where bubbles—individual universes—form and grow. Eternal inflation assumes that this phase of expansion lasts forever in some regions, and taken to the limit, the model predicts a multiverse. Rick explains the workings of the show’s multiverse in “Rick Potion #9,” after unleashing a genetic epidemic that turns the world’s population into writhing blobs of mutant flesh. Instead of cleaning up the mess made of their own reality, he uses the portal gun to transport them to an alternate reality where they are greeted by their own mangled corpses. A number of questions arise from this scene alone, but let’s start with the idea of a multiverse that stretches across infinite realities. While the calculations do predict a huge number of possible universes out there, it still falls short of infinity. “That number is roughly 1 with 500 zeroes, which is a bigger number than the number of ways you could rearrange the atoms on Earth—but it’s not infinite,” said Richard Matzner, a cosmologist at the University of Texas at Austin. The estimate originates from string theory, which gained popularity in the 1990s as a possible “theory of everything” that would merge two disparate frameworks governing the very large (general relativity) and the very small (quantum mechanics). A more recent calculation by Andrei Linde and Vitaly Vanchurin of Stanford University expands on the 10^500 value, taking into account quantum fluctuations that may produce variations of a single universe. Their “humongous” number is 10^10^10^7, although they whittle it down to 10^10^16 when considering the capacity of the human brain to distinguish different universes. So according to the theory, does this mean I have 10^10^16 copies of myself floating around in the multiverse somewhere? Of course not, since the countless possibilities mean many universes would be barren of life, planets, and stars. Perhaps there could be a universe that, like ours, is also expanding—but so rapidly that it doubles in size with every passing second. Any stars, planets, and organisms that exist would be ripped apart or immediately vaporized. Or a universe that only lives for a fraction of a second, instead of the 13 billion years our observable universe has lived. Even though the infinite realities of Rick and Morty include thousands of versions of themselves, they don’t occupy every dimension. “Most timelines have a Rick, and most Ricks have a Morty,” says Rick in “Close Rick-counters of the Rick Kind,” as he is led through the Citadel of Ricks, the secret headquarters where a governing body of Ricks gather together. “This place is a real who’s who of who’s you and me.” A ridiculous detailed Reddit thread describing the workings of the show’s multiverse notes that “there aren’t infinite Citadels of Ricks, infinite C-137s, etc.” and no repeat dimensions exist, either. For Rick to encounter another version of himself, not to mention thousands of them, he requires the means to freely travel between universes. In the show, his portal gun opens up wormholes that connect two different points in space-time and serve as a convenient mode of transportation. But the constraints of our world prevent such a gadget from becoming a reality. Since the 1930s, physicists have toyed around with the idea of wormholes, which are consistent with Einstein’s theory of general relativity. But none have ever been observed, and so their existence remains purely hypothetical at this point. Also, creating your own wormhole would require an infinite amount of energy. So if you are nursing an ambition to jump through space-time from our world—sorry, but you’ll have to live vicariously through Rick’s interdimensional search for Szechuan McNugget sauce. For science fiction, the multiverse is a gold mine of compelling story ideas. But how could we prove or disprove it? Some physicists like Kleban believe we could detect evidence of the multiverse through something called bubble collisions. If the edges of two universes crashed into each other in the distant past, a signature imprint would be left behind in the sky. The hunt for bubble collisions continues, although Kleban himself has acknowledged finding one would be a long shot. “If convincing evidence of the multiverse is found, it would be one of the biggest discoveries in human history akin to the Copernican revolution,” he said. Despite the multiverse’s shaky foundation, the theory provides endless fodder for Rick and Morty and science fiction in general. I appreciate when writers put effort into getting the science right—shout out to Syfy’s The Expanse for being especially good at this—but that’s not what gets viewers hooked. It’s the storytelling, the seamless weaving together of fact and fiction, and the vision for what our future as a species could look like. “The multiverse is such a delicious idea for fiction, and there’s no harm in it as long as there’s a healthy public debate about the actual science,” said Frank. Of course, understanding the science of the multiverse is trivial to a guy like Rick. But we can’t all be reckless, pansexual, alcoholic geniuses.